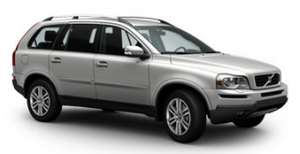 The Volvo XC90 revolutionised the premium SUV market when it was launched in 2003. With its modern design, powerful engines, Roll-Over Protection System (ROPS) and seven-seat capability with up to 64 seating configurations, it rapidly became one of Volvo's best-selling models. It is produced at Volvo's Torslanda plant in Gothenburg, Sweden. With increased refinement, desirability and performance, the Volvo XC90 features elegant exterior styling, a more luxurious and highly-specified interior, allowing it to sit comfortably in the premium SUV sector. The Volvo XC90 is available in Active and SE (D5 only), SE Lux, R-Design and Executive trim levels, all offering a high standard specification compared with most other premium brand rivals. Environmental protection is another foundation stone of all Volvos and the XC90 is no different. The D5 Geartronic engine was re-homologated in 2008 resulting in the CO2 figure dropping from 239g/km to 224g/km. This means that both the D5 manual and Geartronic fall below the key threshold for Vehicle Excise Duty. The Volvo XC90 takes further care of the environment inside the passenger compartment and reduces the risk of allergy-related problems with its Electronic Climate Control (ECC) with automatic Air Quality System (AQS). The Volvo XC90 is available with a choice of two high-performance engines - one diesel, D5 185 PS, and one petrol, 3.2 243 PS, - both of which produce plenty of power and torque from low engine speeds and through the mid-range for maximum flexibility and driving pleasure. The Volvo XC90 features AWD (All Wheel Drive) with Instant TractionTM, with an electronic Haldex coupling system to maximise traction between front and rear axles, yet despite its substantial off-road abilities, it is as easy, responsive and rewarding to drive as any regular Volvo saloon or estate model. In order to optimise safety in the Volvo XC90 and, in particular, reduce the risk of a roll-over, Volvo has fitted as standard a Roll-Over Protection System (ROPS) with Roll Stability Control (RSC) technology. This uses a gyro-sensor to register the car's roll speed and roll angle to instantly calculate the terminal angle and risk of a roll-over, and automatically activate the DSTC (Dynamic Stability and Traction Control) anti-skid system, if required, to help the driver maintain control. For added protection, Volvo has also reinforced the XC90's roof structure with extremely tough Boron steel, which is four to five times stronger than normal steel. In addition, the side Inflatable Curtain (IC) protects all three rows of seats and has been designed to stay inflated longer in case of multiple roll-overs, and to help keep occupants inside the vehicle. As you would expect, the Volvo XC90 scores highly in a variety of international safety ratings, including pedestrian protection test ratings. Volvo has also considered the XC90's crash compatibility with other, smaller cars, and designed a lower cross-member - concealed behind the front spoiler - at the height of a bumper in a conventional car to impact with and activate its crumple zones as intended.